14th November, 2015 . . .
Hielo Grueso . . . 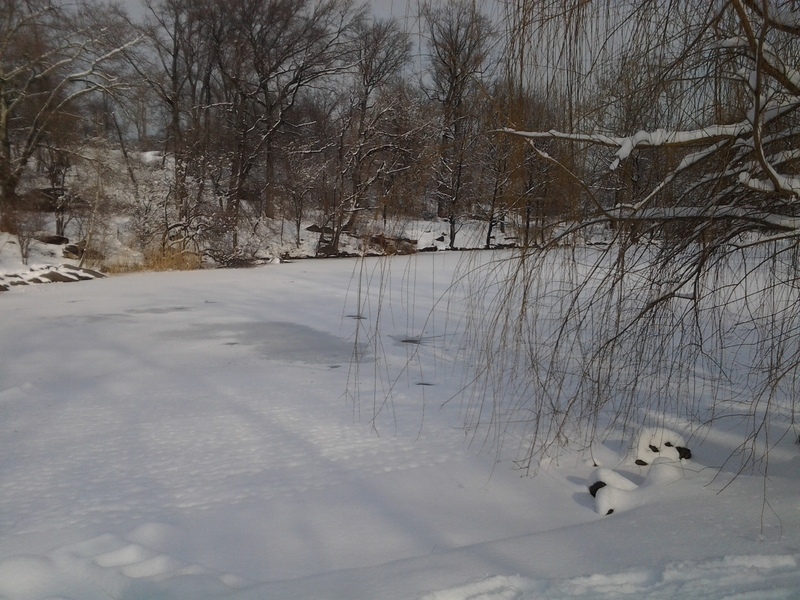 The sign beside this Central Park pond read “Thin Ice” – Hielo Fino en español – and that was on Super Bowl Sunday, the one warm, as in fifty-degree, day during the entire month of February. The NFL did dodge a bullet and scored a great success in the New York metro area. For other sports fans, such as those who fly fish with tenkara equipment, this month has been not so much a disappointment as an extended test is patience. But wait! Yes, wait, indeed: more snow is predicted over the first days of March, which shall be arriving like a lion. 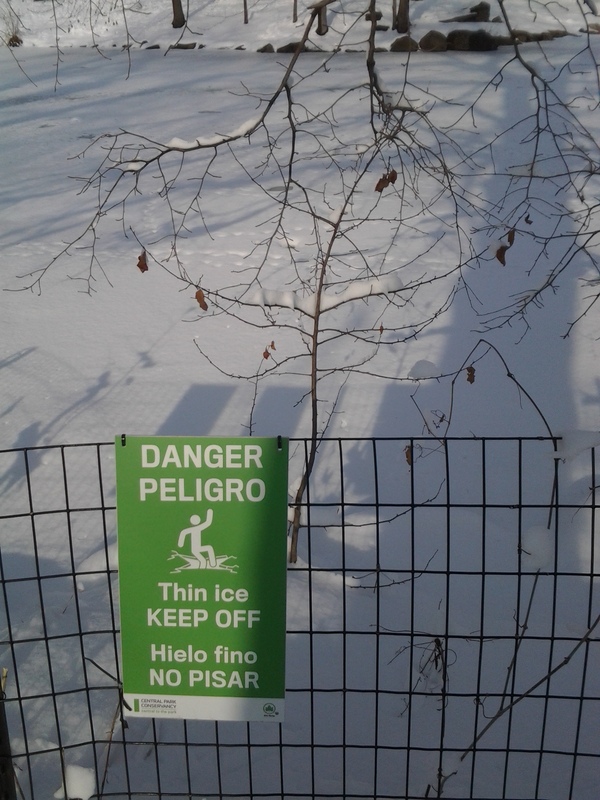 That sign should now read “Thick Ice” – Hielo Grueso! Swegman on the Snakehead . . .
Back in Hand . . . When a fishing tool is used hard, often, or both, some snafu has to be expected at some point. So it occured to me with my Tenkara USA Ebisu, although the problem did not involve wear or breakage – I somehow lost a segment and the handle screw cap in the field. An email to Daniel Galhardo received a quick reply and a solution; send the rod to the repair center in Belgrade, MT. I found a Scotch mailing tube that fit the TUSA rod tube perfectly and mailed the package on April 19. Today, ten (10!) days later – Ebisu is back in my grip! This has been, hands down, the best customer service I have yet experienced with any company. Thank you, Daniel, John, and Tenkara USA! 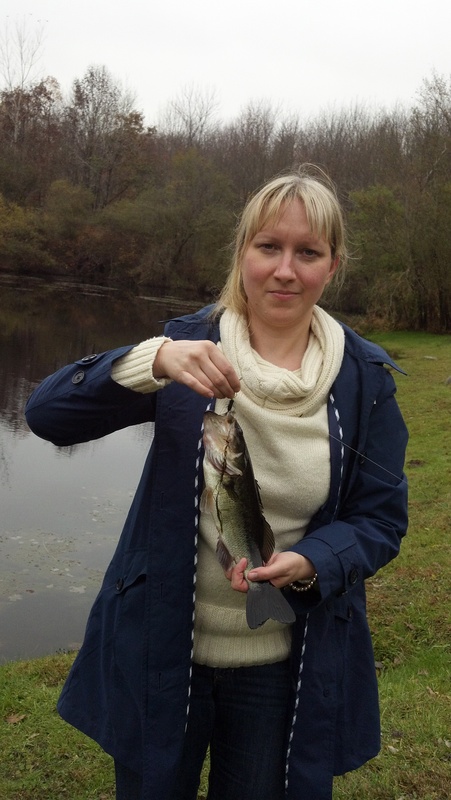 Little Pond, Large Bass . . .
Small ponds hold deep potential for tenkara anglers on the hunt for large bass, especially in autumn when resident sunfish head for deeper water. With the sunnies bedding down for the colder months, and out of the feeding area, a gray fall day can offer the most focused largemouth bass fishing of the year. 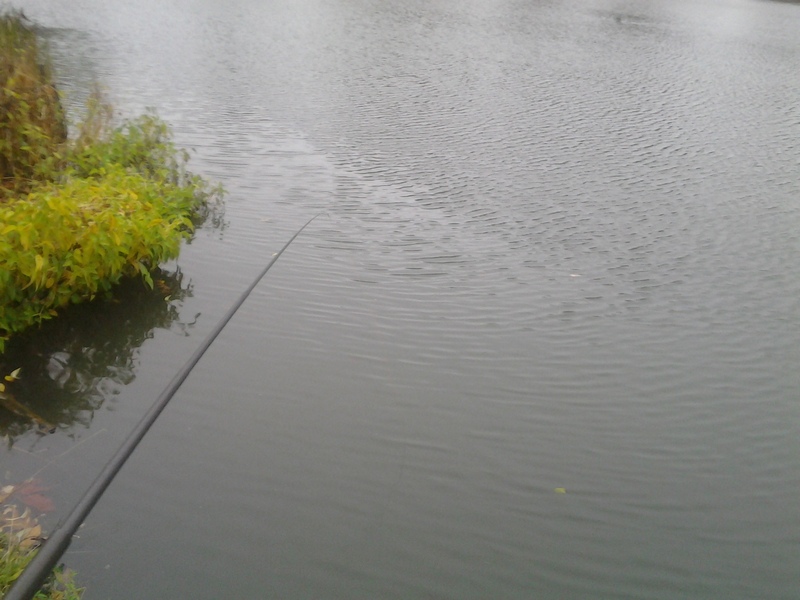 A long, limber, tenkara rod can be used to work the shoreline, along the weedline dropoff, where mature bass tend to cruise the dark water in search of a few last bites. A green Matuka, fished slowly so its feather and fur could undulate in the microcurrents, proved this to be true during an October outing around a little country pond somewhere within the Croton Watershed in Westchester County . 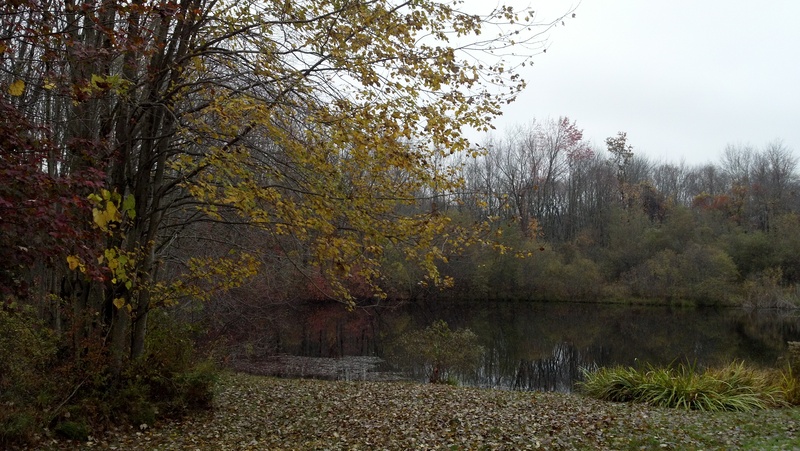 . .
Perhaps a foot of water lay above the submerged weeds of this pond. There are many openings in and amongst this type of plant growth where largemouth bass will hide, waiting to ambush a baitfish, crayfish, or nymph. Throughout this season the fixed length of the tenkara level line has allowed me to cast more accurately into this environment because I am working with, rather than against, the physical limitations of the tenkara tackle. I feel like I am shooting a narrow arrow rather than casting a wide net. The happy result is greater consistency in placing the fly over the target – and the fish – a situation that increases the number of direct encounters and, on a good day like this day, solid hookups with large bass. Tenkara in the Dark . . .
Summer has arrived and with the season comes heat, humidity, and an angler’s need to modify both the technique and time of the fishing in order to optimize the sport’s chief objective: outdoor action. I usually fish alone, and during the day, but my most recent tenkara trip was an after-work group outing of urban anglers. Tony, Edwin, Jesse, and I, as well as a couple of other friends in the observer role, spread out around the west side of Harlem Meer at dusk in search of a refreshing breeze interspersed with bluegills, largemouth bass, and black crappies. The slanted evening light spilled over the towers and tree tops alike as I worked a Deer Hair and White soft hackle along the pond’s weed edges. A few bluegills fell for the fly, enough to keep me busy. When I did pause to look up and around me, I was surprised to see another angler, not of my party, also fishing with a long rod. As our trajectories brought us closer and closer together, I took notice of an interesting detail. Something was missing . . . his reel! Yes, I encountered my first tenkara stranger outside of cyberspace. He carried two rods with him so, after introducing ourselves, we took a few minutes to speak the praises of the streamlined simplicity tenkara has given to our city fishing. Meanwhile, the sun set and conditions changed: the bass remained elusive; the bluegills vanished for the most part. My three compadres had by this time clustered along a favorite strip of shoreline near the southwestern end of the Meer; a spot known for large nighttime bass. 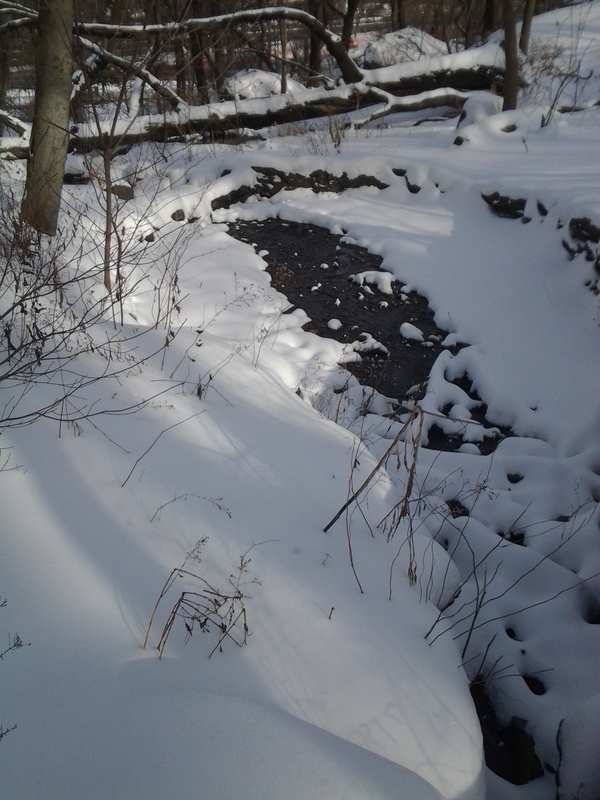 Their presence soaked up a majority of the spot’s bank space, so I walked farther east to where a small island forms a channel about thirty feet in width. I was now out of sight, without a light. Night was falling quickly, so before I lost all of the available light, I tied on a small (size 12) Brown Woolly Bugger with a bead head. A black-crowned night heron and a foraging raccoon joined me by the water as I began to cast into the darkened depths of the Meer. By this time only anglers remained. The joggers and dog walkers had gone back to their air-conditioned indoors. The pattern’s bead head changed everything. On my first cast I felt a light jiggling take that soon revealed the full extent of the Ebisu model’s flexible 5:5 action. 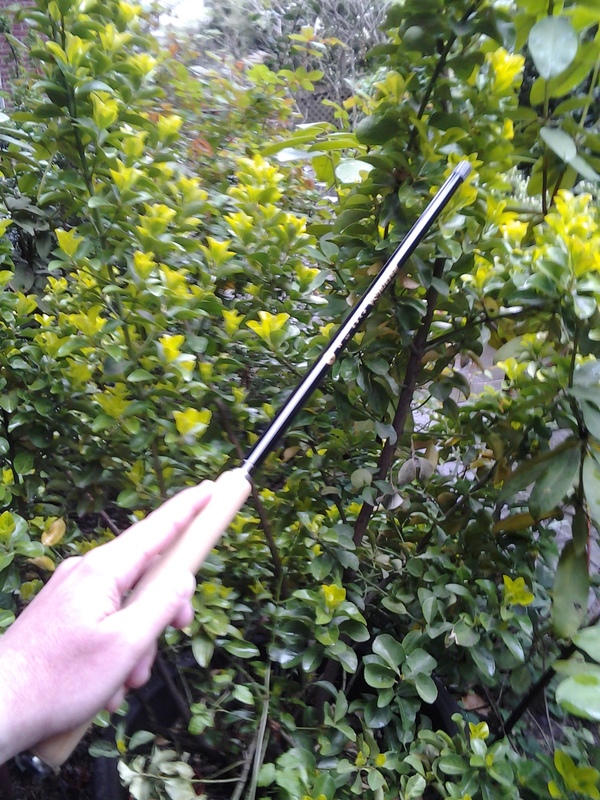 I raised the rod perpendicular to the pond, which coaxed the fish to the surface. The headshaking commenced as well as an impressive spiraling dance. The limber tip registered all of its variations. This back and forth ballet lasted for over a minute before I had control enough to lift a silvery foot-long black crappie onto the bank. The real challenge (as opposed to the reel challenge) occurred when I attempted to photograph the fish. The most daunting aspect of night fishing, for me, falls under the documentation department. I have a fairly good eye for composition, but my mastery of lighting remains to be seen in the exact sense of the word. 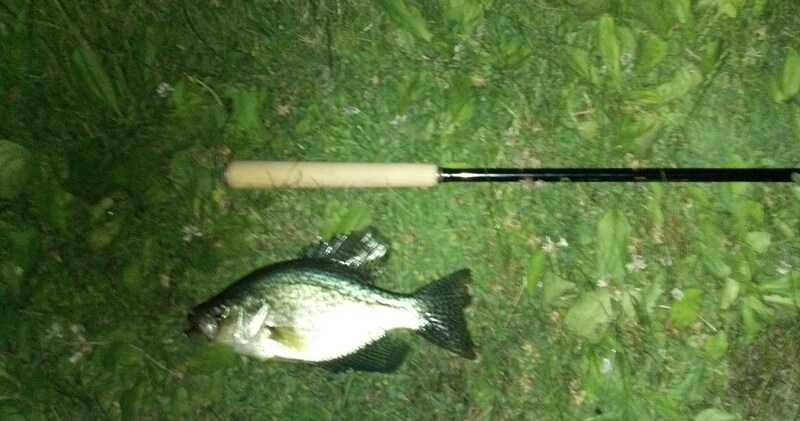 The absence of sun, the resulting use of flash, left me with a well-composed, yet blurry, portrait of a big crappie resting parallel to the Ebisu on the damp grass. At least the scale of the fish was documented. This trip was a group effort, as I mentioned, and that comradery soon proved its worth. Tony was the first to stop by to see why I had disappeared behind the island. The blurry image of the crappie, and another solid jiggling hit right before his eyes, answered him better than any loquacious verbal explanation. He switched to a bead head as well. 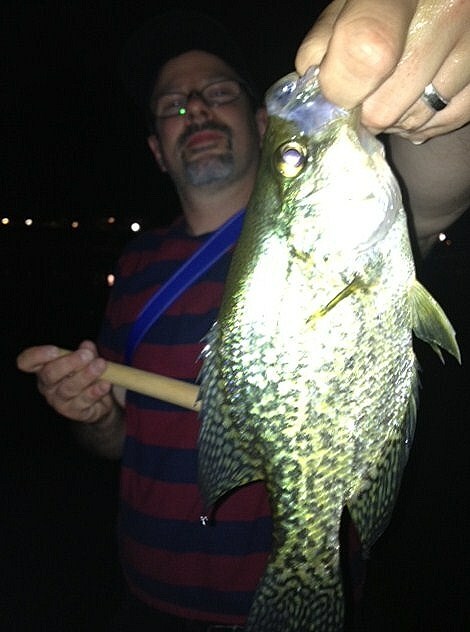 Soon all four of us were back together, sometimes pulling in a quartet of crappies simultaneously. The action was so good that each one of us was satisfied to pause occasionally to take a snapshot or two . . .
. . . Thanks, Tony!